Recently I’ve been thinking a lot about design, and specifically how the environments we encounter can suggest that one take a certain course of action. By keeping my shoes near the door to my apartment for my own convenience I’d accidentally created a bad design — a situation that subtly suggested one should remove one’s shoes, but didn’t offer any place to sit while doing so. I honestly don’t care if people remove their shoes or not but I want people to feel welcome if I’ve inadvertently suggested it. What I needed was a place to sit. Yeah, I mean I could have just bought a chair or a stool, or even found one on Craigslist. But that’s no fun. 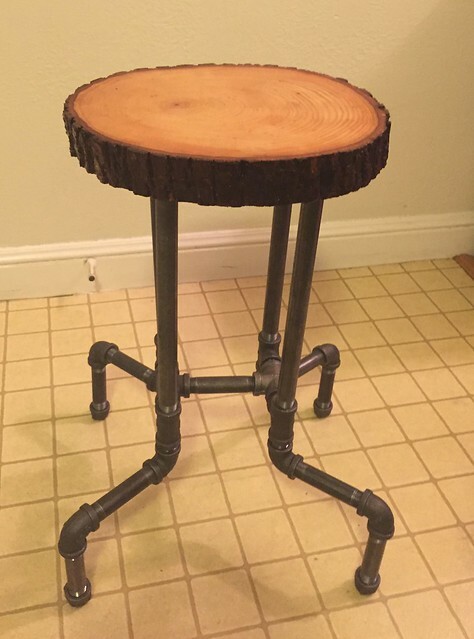 Loosely following the design from this blog post I bought some iron pipe fittings at the hardware store and for the seat I purchased a tree slice from Amazon. I removed loose bark from the tree slice and applied a few layers of spray-on lacquer. The pipes were more of a challenge. After a couple hours of wrestling with heavy iron pipes (and getting a few bruises along the way) I managed to get the pipes locked tightly into place. Then it was simply a matter of adjusting the caps at the bottom until the thing was level, and the floor flanges on the top so they were all level with the seat. A few screws later, and I had a most unusual homemade stool. But most of all I solved a small design problem I’d accidentally created in my own living space. Previous Entry: Wait, why did The Flash run past the Transamerica Pyramid? Previous Entry Wait, why did The Flash run past the Transamerica Pyramid?